House washing is a service we provide to keep your house looking its best. Power Wash Services also offers home exterior painting, restoration and window washing services. We safely and effectively clean all types of exterior surfaces with environment friendly chemicals. Exterior house washing is started with a biodegradable detergent presoak to protect plants and the environment. The surface is hand brushed with extension poles reaching two stories and also brushes windows clean. The exterior is rinsed with hot water (180 degrees F) at 1,500-2,300 psi. 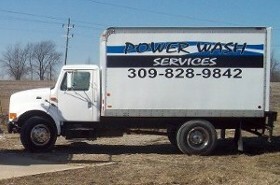 Power Wash Services takes care not to wash water behind siding or windows and leaves no residue or streaking. A spot free rinse is also available. Painting Home Exterior:The surface is cleaned with biodegradable detergents to remove dirt, mold, and mildew. Loose paint and oxidation is removed with TSP, a rotating tip and hot water at 3,000-3,500 psi. Wood siding: usually has a high concentration of dark black mold causing the siding to appear dark and have uneven color below windows or in shaded area. Special care is taken not to harm paint or leave siding with an uneven color. Vinyl siding: is typically the easiest to clean. Aluminum and steel siding: are similar to wood siding in respect to the paint. The age of the siding must be watched for thinning paint and silver oxidized spots indicating weak or worn paint.